US Ambassador to UN says US ties with Russia are 'very strained' following Syria missile strikes, says US not withdrawing from Syria yet. The United States has frozen plans to withdraw its forces from Syria, US Ambassador to the United Nations Nikki Haley said Sunday, citing the recent suspected Syrian chemical weapon attack in Douma. Earlier this month, President Trump revealed that he was planning to remove the roughly 2,000 US troops deployed in Syria, mostly as advisers to rebel groups, in the near future. White House Press Secretary Sarah Huckabee Sanders echoed the President’s comments, saying that the US mission in Syria, aimed primarily at defeating radical Islamist terror groups like ISIS, is “coming to a rapid end”. But on April 7th, dozens of civilians were killed in the city of Douma, east of Damascus, in what the US and other allies later described as a chemical weapon attack by the Assad regime on the rebel-held city. Russia, Iran, and the Assad regime denied the claims, arguing that the chemical weapon attack was “staged”, a ‘false-flag’ attack, or the product of Western propaganda. Israeli fighter jets later struck a Syrian airbase believed to house Iranian drone aircraft. Over the weekend, US and allied forces launched over 100 missiles at targets in three different sites in Syria used for Assad’s chemical weapon program. On Sunday, Ambassador Haley told Fox News that the American withdrawal from Syria was off the table for the time being, stating that the US would remain involved in the war-torn country until it had achieved its goals. 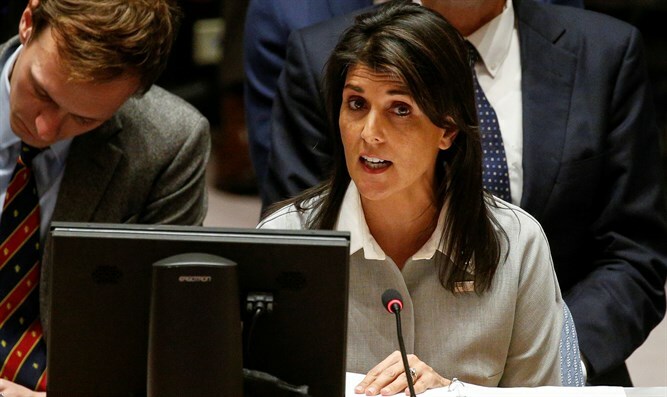 America’s goals in Syria, Haley said, included the defeat of the ISIS terror group, ensuring that chemical weapons do not threaten US interests, and monitoring Iranian actions in the region. The ambassador added that ties between the US and Russia had become “very strained” in part due to the conflict in Syria. Nevertheless, Haley said, the US remains optimistic it can improve relations with Russia.